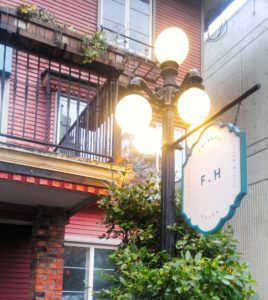 Located near Coal Harbor, just South of Stanley Park, nestled snugly on the corner of Alberni and Cardero is a lovely little red house creating noteworthy Irish cuisine. 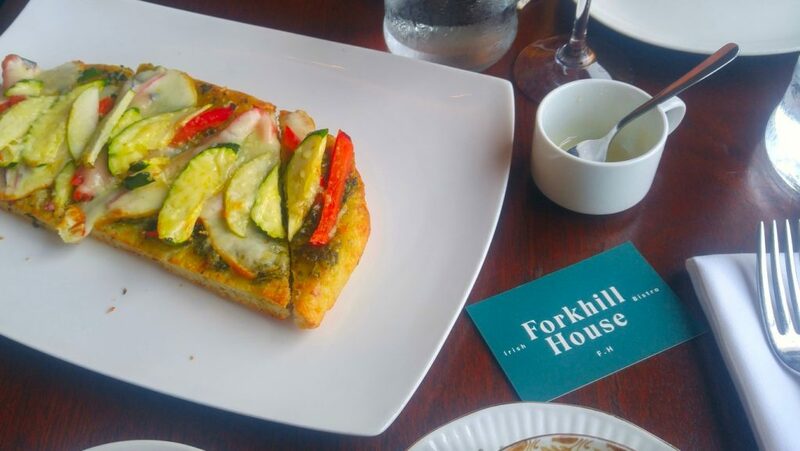 The Forkhill House Bistro is producing beautifully executed traditional Irish fare with a fine dining twist. The warm inviting atmosphere and picture perfect plates are complemented by the exceptional service and delicious dishes. Having grown up in an Irish family but never really having been introduced to Irish food made me especially excited to dine here and get the opportunity to experience some of my roots. When looking at the menu I was pleased to see that this is is not your typical meat and potatoes establishment. There were many vegetarian options available on the Brunch/Lunch menu and I could not resist trying every one! I fell in love with the Potato Tart. Thinly sliced potato, rich egg and a crisp melted Swiss cheese on top of a flaky crust. 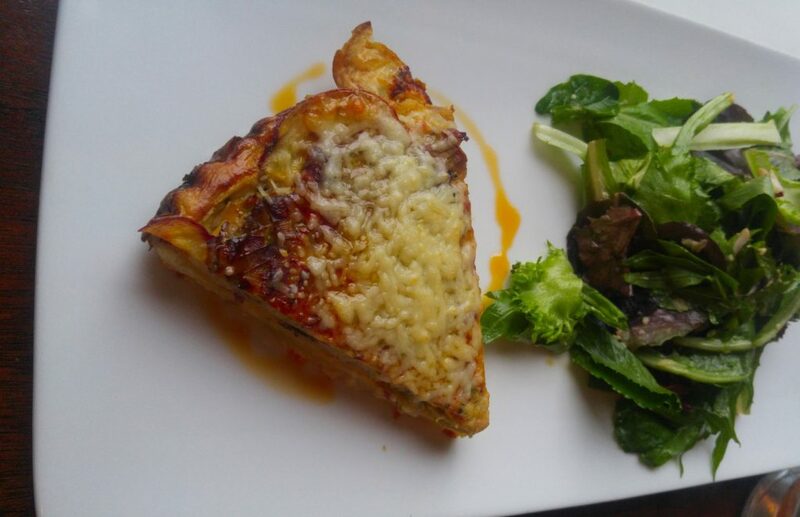 An exquisite savory wedge that I kept going back for more of. It was paired with the Robin’s Boring Salad containing mixed greens, smoked mozzarella, sliced sticks of celery and crisp apple. It was complimented beautifully by a light but flavourful caraway seed dressing. I was especially impressed by the Veggie Flat. Thick Focaccia bread with a vibrantly herbaceous sauce, melted smoked mozzarella and a sprinkling of grilled zucchini, apple and sweet pepper. Bursting with flavour and a good size for sharing. For dessert I convinced my companion to indulge with me so we could share two options I just could not pass up trying. The Guinness Chocolate Cake and the Sticky Toffee Pudding were both extremely generous portions. The Chocolate Cake was airier than expected and mildly Guinness flavoured. The chocolate sauce drizzled on top provided that perfect addition of moisture to the already moist cake and the whipped cream helped balance the chocolately richness. The Sticky Toffee Pudding was a surprisingly light cake laced with an abundance of raisins. The Toffee sauce added just the right amount of sweetness to every bite and the vanilla ice cream was a refreshing contrast. These were definitely worth over stuffing ourselves for. It was an absolute pleasure Forkhill House. Service: Excellent! Warm and welcoming. There were a few vegetarian dishes I tried that were a three star opposed to four. My guest said that all of her selections containing meat were prepared perfectly though. The drink menu was exceptionally put together, with the alcohol types assigned by page. There was a whisky menu which we loved and the cocktail we tasted (The Gin Fizz) was absolutely delicious. Very memorable indeed! 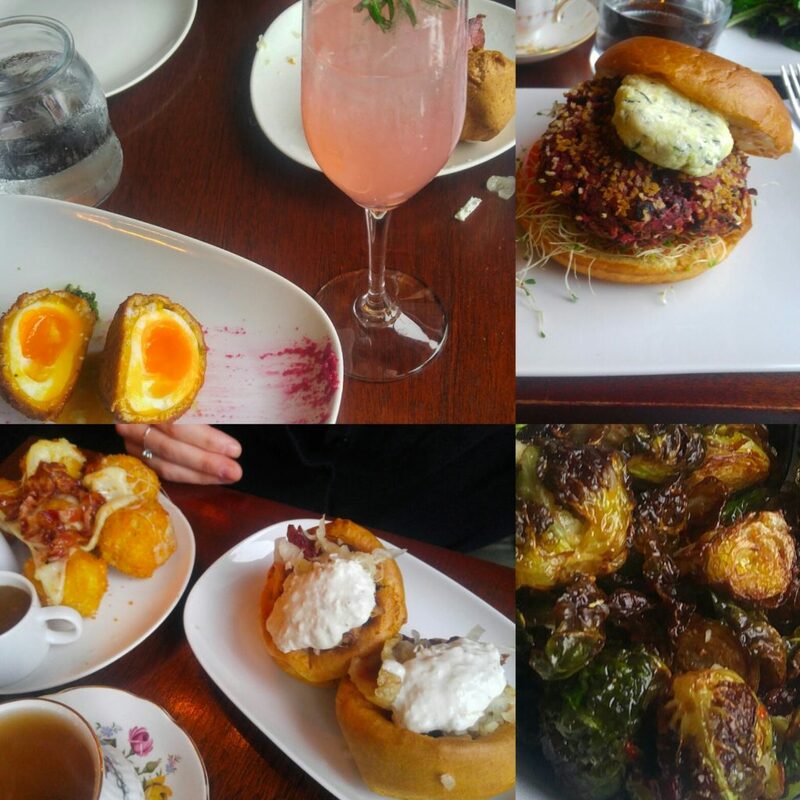 Top Left: Scotch Egg (Soft Boiled Egg Wrapped with Parmesan Crusted Fennel Sausage, Cilantro Garlic Sauce) and a Gin Fizz. Top Right: Veggie Burger (Beet, Quinoa, Walnut and Mushroom Patty, Lettuce, Tomato, Red Onion, Goat Cheese). Bottom Left: Colcannon Croquettes (Chive and Bacon Whipped Potato Stuffed with Swiss Cheese, Served with Curried Ketchup and Demi) and The Yorkies (Corned Beef and Sauerkraut Stuffed in Traditional Yorkshire Pudding with Creamed Horseradish). Bottom Right: Brussels Sprouts (Crispy Brussels Tossed in Garlic and Chilli Flakes).